A 39 year old African American woman presented to the clinic with eye pain and blurred vision. She had a history of angle recession glaucoma in the left eye and unfortunately developed bleb associated endophthalmitis following trabeculectomy, leaving that eye with LP vision. Her right eye had previously done well with no signs of glaucoma. On this visit, both eyes were injected. Her right anterior chamber had 1-2+ cell, as did her anterior vitreous. The left eye had 1+ corneal edema and scarring, as well as trace cell and 2+ flare. There was chronic rubeosis and there was a dense white cataract with no view posteriorly. On posterior exam of the right eye her cup to disc was 0.4 and her disc was hyperemic. 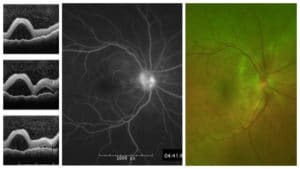 She had multiple discreet large areas of subretinal fluid, appearing to emanate from around the nerve and in the macula. Review of systems: otherwise negative except for possible tinnitus when asked. OCT demonstrating large pockets of subretinal fluid on multiple cuts. 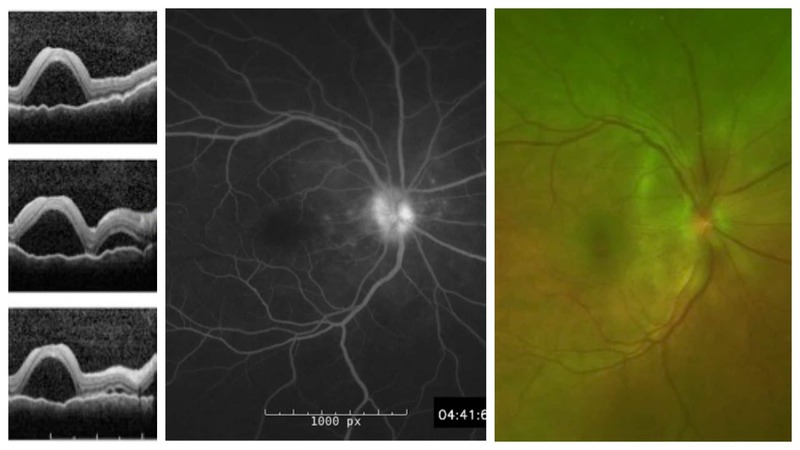 Late phase fluorescein angiography demonstrating mild disk hyperfluorescence and pooling in the areas of subretinal fluid. Pseudo-color fundus photo demonstrating multiple pockets of subretinal fluid in the macula and around the disc. Vogt-Koyanagi-Harada disease (VKH) is characterized by bilateral posterior uveitis with serous exudative detachments and systemic signs of meningismus, tinnitus, vitiligo, alopecia, poliosis. There is extensive overlap of this disease with sympathetic ophthalmia (SO), and one of the diagnostic criteria for VKH includes absence of eye surgery or trauma. However, sympathetic ophthalmia is much more uncommon when compared to VKH and the systemic symptoms are rare in SO. There are multiple stages of VKH disease. The prodome phase may present with fever, orbital pain, meningismus, nausea, tinnitus, dizziness, light sensitivity and tearing. The acute uveitic phase presents with bilateral posterior uveitis characterized by disk hyperemia or leakage, choroidal thickening, and serous retinal detachment. It then spreads to include bilateral anterior uveitis, with cell and flare. Alopecia, tinnitus, and meningismus are often present at this time as well. The chronic uveitic/convalescent phase presents weeks later with choroidal depigmentation, as well as vitiligo, poliosis, and perilimbal vitiligo (known as Siguira’s sign). The recurrent phase is characterized by episodes of granulomatous anterior uveitis. Serous detachments are rare during this phase. Treatment is initiated with very high dose corticosteroids, tapered over 3-6 months at least. Reports suggest that steroid treatment can help prevent systemic and chronic ocular manifestations. Additionally, if the patient experiences recurrences, then additional immunomodulatory medications, such as cyclophosphamide, mycofenolate mofetil, cyclosporin, methotrexate, and now Humira, have been beneficial in reducing recurrence and sparing steroid treatment. Our patient is interesting because of her left eye history. It is possible that she has sympathetic ophthalmia rather than VKH, however given her mild tinnitus and rarity of SO compared to VKH, we feel that VKH is the more likely diagnosis. Either way, the treatment course is the same, with very high dose steroids being the mainstay of initiation treatment. She has improved significantly since starting steroids, and after 2 weeks the serous retinal detachments have improved at which point the steroid taper was started. She has also been referred to rheumatology, who will help initiate therapy with Humira if she recurs during the steroid taper.